Pavement edge drop-off poses a particular hazard when vehicles leave the roadway. Safety Edge being placed during paving (Shauna Hallmark et al./Institute for Transportation). 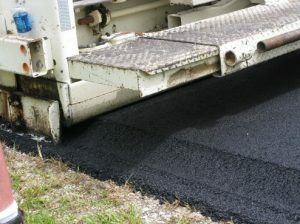 Pavement edge drop-off is a vertical elevation difference between two adjacent roadway surfaces—usually a paved roadway surface and an unpaved shoulder. Edge drop-offs are potential safety hazards because significant vertical differences between surfaces can reduce vehicle stability and affect a driver’s ability to handle a vehicle. Pavement edge drop-off is a contributing factor for around 18 percent of rural run-off-road (ROR) crashes in Iowa on paved roadways with unpaved shoulders. Pavement edge drop-off-related crashes were two times more likely to result in a fatal crash than other crashes on similar rural roadways (Hallmark et al. 2006). The Safety Edge is placed during paving and creates a 30 degree edge providing a sloped surface that is more easily negotiated by errant vehicles. The effectiveness of the Safety Edge has not been well studied, but one study provided a crash modification factor (CMF) of 0.943. Additionally, it provided a benefit-cost ratio of 4.4 for roadways with paved shoulders and 4.63 for roadways with unpaved shoulders (Graham et al. 2008). 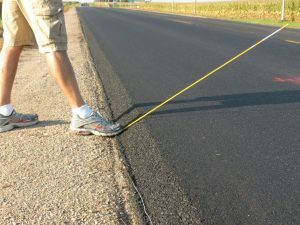 The Safety Edge was applied during a large number of paving projects in Iowa during the 2011 to 2013 construction season. More information about the safety benefits of the Safety Edge is provided in this technical brief, Evaluation of Safety Edge Benefits in Iowa (PDF). Use of the Safety Edge was also included in Lane-Departure Safety Countermeasures: Strategic Action Plan for the Iowa Department of Transportation (PDF) (Nambison and Hallmark 2011). Graham, Jerry L., Karen R. Richard, and Douglas W. Harwood. Safety Evaluation of the Safety Edge Treatment, Year 1 Interim Report. MRI Project No. 110495.1.001. Midwest Research Institute, 2008. Hallmark, Shauna, David Veneziano, Tom McDonald, Jerry Grahan, Rushi Patel, and Forrest Council. Safety Impacts of Pavement Edge Drop-off. AAA Foundation for Traffic Safety, 2006.